Cyril Delahaye lived in Ystradgynlais and was an Assistant Scoutmaster before he volunteered for service in 1914. He attained the rank of Second Lieutenant in the Royal Engineers before being killed in action in France in 1918. 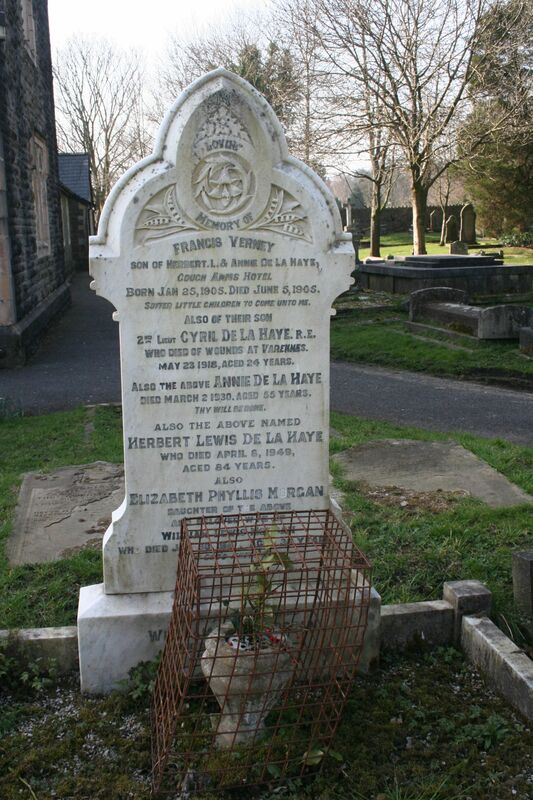 The information on Cyril Delahaye has been compiled from a number of sources, including the Commonwealth War Graves Commission, from the Labour Voice newspaper, and the Parish Burial Register (courtesy of the Swansea Archives). Unit and Regiment Royal Engineers; N Spec. Coy. Additional Information Address 'Claremont', Station Road, Ystradgynlais, South Wales. Cemetery VARENNES MILITARY CEMETERY - FRANCE; III. B. 3. 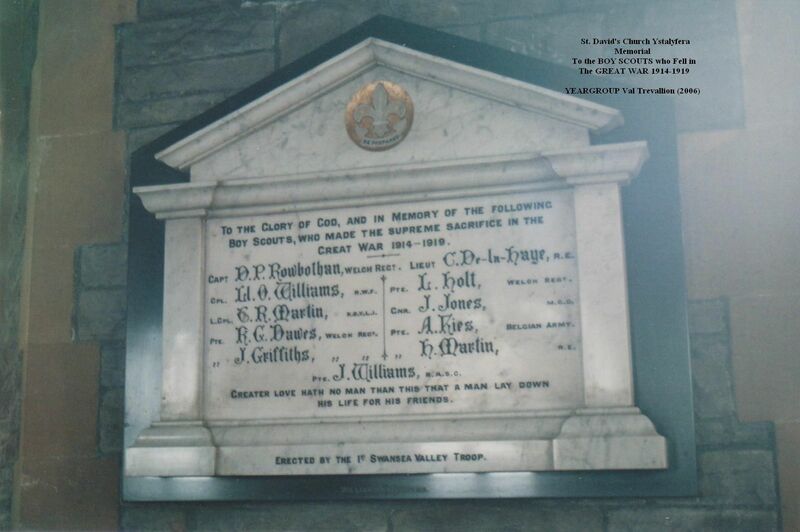 To the left is the Scouts Memorial, listing Cyril Delahaye, in St. David's Church, Ystalyfera. Cyril de La Haye was made Assistant Scoutmaster and shortly after he volunteered for the Services at the outbreak of World War I. He was one of the eleven Varteg Scouts killed in WWI. Hubert, his brother, was a keen scout and excellent drummer. 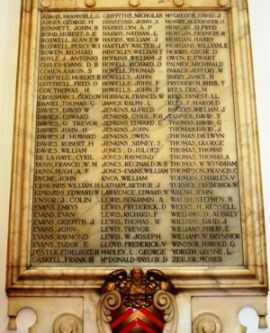 Both were sons of the Station Master at Ystradgynlais. Corporal Cyril De La Haye (son of the local Stationmaster), went out to France with his regiment a few days ago. Mr De La Haye was a science student at Cardiff University prior to the outbreak of the war and enlisted along with several other fellow students in September. Mr De La Haye, station master, has received a letter from his son Cyril this week from France. For a month after the battle of Loos, Private De La Haye was in hospital suffering from influenza and a general break down in health, but we are glad to learn that he has now quite recovered and is back at his duties near the firing line. Corpl. Cyril De la Haye also came from France on Sunday and returned on Wednesday. He is with the Royal Engineers. On Monday evening, at the Cynlais Café, Corporal De la Haye was presented with a medal, a New Testament and £1 by the local reception committee. The presentation was made by Mr. Howell Phillips, and the Rev. Jas. Jones, BA rector. Cyril De la Haye’s brother, Pte. Hubert De la Haye, who is with the RAMC on Salisbury Plain, was allowed home to see his brother before he returned. Mr. and Mrs. De La Haye (station master) have received a letter from their son, Private Hubert De La Haye who is with the R.A.M.C. in Mesopotamia. Private De La Haye, who is possessed of a well developed (sense) of humour, says he has visited the Garden of Eden, but found no apples there! A friend of Sergeant Daniel Jeffreys, 2nd Lieutenant Cyril De La Haye, has also been home on draft leave. He joined the Royal Engineers at the same time as Sergeant Jeffreys joined the R.A.M.C., and after considerable service in France, was sent home a few months ago to train for commission and he has been successful in passing his examinations. Cadet Cyril De La Haye, son of Mr and Mrs De La Haye of Station Road Ystradgynlais, has been officially notified that he has been gazetted as second lieutenant and posted to the Royal Engineers. He was well known in football circles, having often played for the Ystalyfera XV in the three quarter line. He is an old Maesydderwen County School Boy. Seldom has such a wave of sympathy passed over Ystradgynlais as was the case on Saturday when Mr and Mrs De la Haye (station- master) of Claremont received the sad intelligence that their son, Lieutenant Cyril De la Haye, of the Royal Engineers, was killed in action on the morning of last Thursday. The deceased soldier was 24 years of age, very popular, and a most promising young man. He was an old pupil of the Ystradgynlais County School. He was also a scout-master in the 1st Swansea Valley Troop of Boy Scouts. At the commencement of the war he was a student at Cardiff University College where he was held in the warmest regard by all. He took a keen interest in all the games, and was vice-captain of the football team for 1913-14, and was selected captain for 1914 – 15. He joined the Public Schools Battalion (Royal Fusiliers) and was transferred to the Engineers in 1915, with which unit he served in France for three years, first as a corporal, then as a lieutenant. Letters of a most sympathetic nature have been received from his comrade, Lieutenant W. Walters, Captain A. S. Belling, and Captain Ivor P. Morris, and all the letters bear testimony to the warm regard in which he was held by both officers and men, some of the former having been his superiors when he served as an N.C.O. in his old unit. Evidence of the esteem in which he was held may be gleaned from the fact that in all the letters he is referred to by Christian name, Cyril. 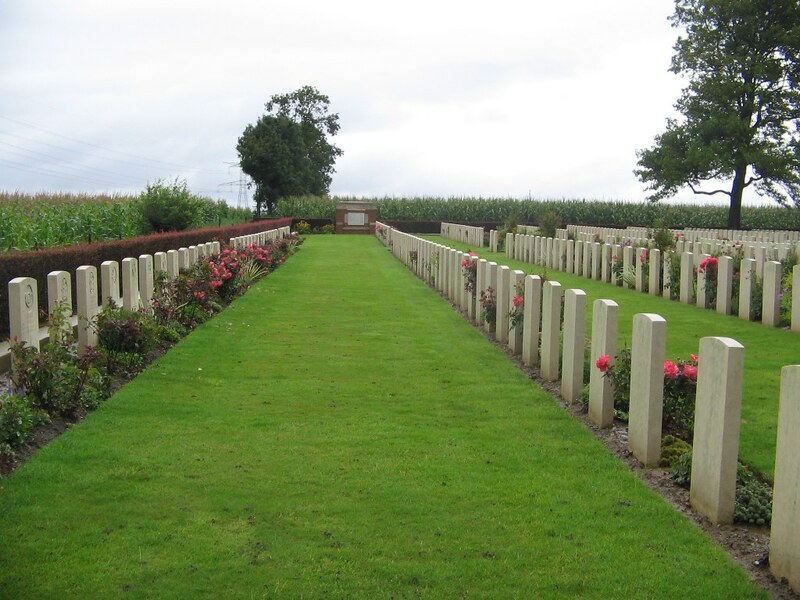 Every man in his Company, who could be spared, attended the funeral on the 23rd inst., 6 miles behind the lines. One of the officers’ states: "He was loved by us all as a splendid officer and gentleman, and possessed brilliant characteristics of courage, insight and thoroughness, which combine to make the finest leadership. As a man he was revered by all for his sym- pathetic and staunch qualities. A very large circle of friends and acquaintances deeply sympathise with Mr and Mrs De la Haye and family in their sad loss. Deceased's only brother is also on active service. I cannot refrain from writing a few words in appreciation of my old pupil, Cyril de la Haye, whose death on the field of battle has brought such grief not only to his stricken parents and near relatives, but also to a wide circle of friends who had learned to respect and love this gallant young man. His character corresponded with his physique; upright, symmetrical, pleasing, strong and reliable. During his five years with me, I never once had occasion to doubt his word: I found he could always be trusted implicitly to do anything he had undertaken; his desire to win approval was not obvious, but it was sincere. There was not a pupil in the school who did not place in him absolute confidence, and give him genuine affection. Such was Cyril—modest, lovable, silent, self-reliant, straight, clean, brave; what finer qualities could go to the making of a young soldier? It is a hackneyed phrase, "his country is poorer for his loss" —but in this case so truly does it describe the gap made by his departure that we forget its triteness and realise its truth. Long will his old school love and cherish his memory: those who taught him and who had some part in the moulding of his fine character will think of him as a noble example to hold up for the admiration of future generations of scholars. His young life was but at its dawn, but the stress of these days brought it to its meridian, and he died with the achievement to his credit, that carries with it an immortal glory not to be gained by a septuagenarian whose life has been spent in episodes of selfish mediocrity. Our sympathy goes forth abundantly to his family—mourning a model son-affectionate and dutiful; and a brother whose comradeship was ever to be relied upon. In all my long experience of teaching no name appeals more tenderly to me than that of this young hero, this young Welsh- man-Cyril de la Haye. His name will go down as an imperishable memory and an immortal inspiration to the future pupils of his old school at Maesydderwen. May his rest be peaceable—the rest so nobly earned! By Mr J Walter Jones B.A. 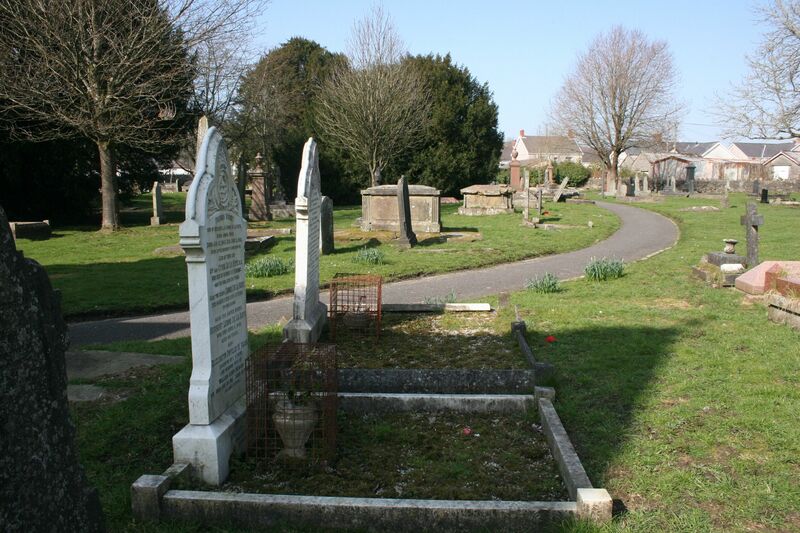 We regret to report the death of Mrs. Anne De La Haye, wife of Mr. H. L. De La Haye of Claremont, Station Road Ystradgynlais. The deceased lady who was about 55 years of age, had been ill for about 10 days, and her death came as a great shock to her friends and acquaintances. She leaves a husband and grown up son and daughter ….one of her sons was killed in the war. She was a faithful member of the Parish Church being actively connected with the Mother’s Union, Sanctuary Guild and was also a Sunday school teacher for many years. She was well known in the district, having carried on business at Cynlais Café for many years, this being the central restaurant of the place. Her husband was for many years stationmaster under the Old Neath and Brecon Railway and the Great Western Railway, retiring about two years ago.